Wednesday October 9th 1895 It was a fine day. The boys helped me clean the dining room. They put up the stove. I got my pickles all put away in jars and made tomato catsup. I washed the dining room curtains. The boys got the hungarian hay in the barn. It has been an awful busy day, went to bed early Thursday October 10th 1895 I cut up more green tomatoes this morning and cleaned the silver and did a little more work in the dining room. In the afternoon I trimmed my hat a little more and sewed some. Will was down town in the afternoon. Friday October 11th 1895 It was raining this morning and kept it up till nearly noon. I put away the rest of my green tomatoes and stewed a pumpkin besides getting the dinner. Will and I went to [Devins?] in the afternoon. We stopped in town as we came back. I saw Mrs. Luce. She will keep house for me. I did my work, fixed the collar of my black dress in the evening. 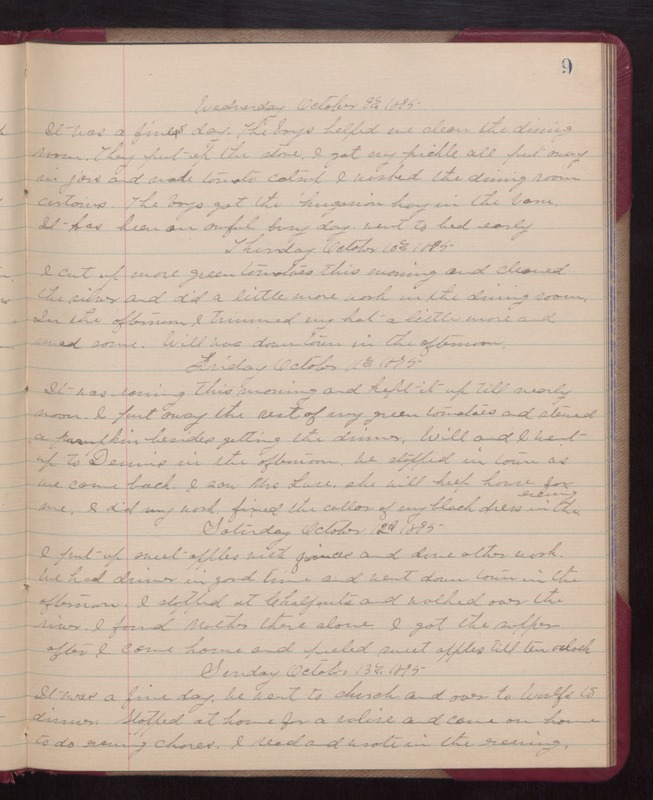 Saturday October 12th 1895 I put up sweet apples with quinces and done other work. We had dinner in good time and went down town in the afternoon. I stopped at Chalfants and walked over the river. I found Mother there alone. I got the supper after I came home and peeled sweet apples till ten oclock. Sunday October 13th 1895 It was a fine day. We went to church and over to Woolfs to dinner. Stopped at home for a valise and came on home to do sewing chores. I read and wrote in the evening.